It is yet another facet of the crisis of civilization, particularly manifest in developed economies like the US and the UK. But the evil practice of mindless wastage of food, when one in seven of the global population — that is, one billion people — goes to bed hungry every night is catching on fast with emerging nations like China and India. In some developing countries too, where urbanization is spreading rapidly, the food wastage culture is threatening to raise its ugly head. As purchase points of fruit, vegetables and other food items for the growing ranks of the middle class in emerging nations shift from neighbourhood shops to supermarkets, extravagance in buying is becoming increasingly visible. This is very much in excess of actual food requirements of families. 80% of fresh water used annually. Uneaten food also accounts for the single largest portion of the US municipal solid waste that goes into landfills. 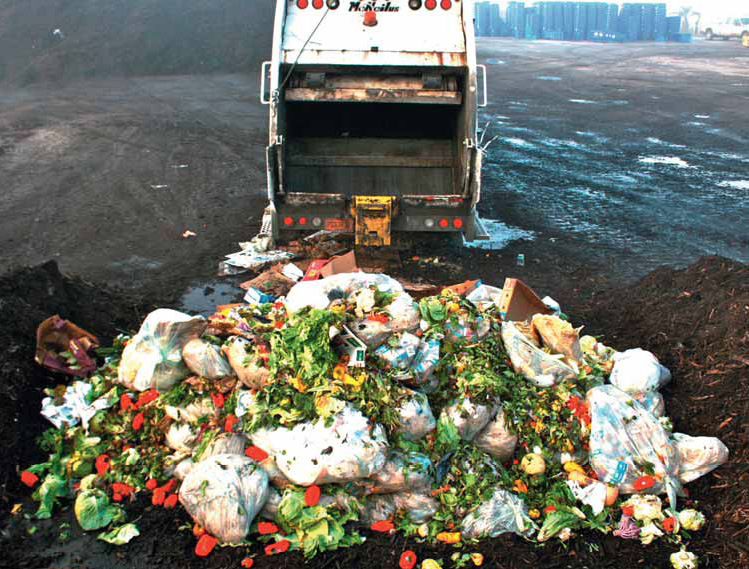 Methane emissions by food rotting in landfills, therefore, remain a point of irritation for environmentalists. Based on a recent compilation of figures by the Waste and Resources Action Programme from two studies involving nearly 3,000 households across the country, the UK does not show itself in any better light either. Britons are found to be throwing away annually around 7mt (million tonnes) of food, including 1mt of untouched items. In this is found confirmation of an earlier finding by Institutions of Mechanical Engineers that close to half the food bought from UK supermarkets ends up in the bin. Except for a small percentage of the population of developed countries aware of the dimensions of global hunger, and who believe that discipline in food buying and consumption at the micro level could make a change in the situation, the rest are given to mindless indulgences. Experts see in this behaviour a bizarre psychological disorder that people have come to believe that they have not provided properly for their families unless food is left on the plate or rots in the fridge. If extravagance in buying in blithe disregard of global hunger is a curse of developed economies, India and several other countries will let go to waste astonishingly large quantities of food at every stage of the journey from the farm to the table. B.Thiagarajan, member of Indian Planning Commission committee on ‘encouraging investments in supply chains’ says deficits in technology inputs in farming, cold chain and logistics are causing huge annual losses of horticulture products running into millions of dollars. The Food and Agriculture Organization of the United Nations estimates that nearly 40% of India’s fresh fruit and vegetables worth an estimated $8.3bn will routinely perish before reaching consumers. What the FAO survey has not, however, taken into account is the growing family level (middle class upwards) wastage of food in Indian urban centres. It also has become an annual feature with India that a combination of unscientific storage and leaving foodgrains exposed to nature would lead to post-harvest rotting of over 16mt of foodgrains. The World Bank says the annually wasted foodgrains, worth at least Rs500bn, could feed one-third of the country’s poor. But India is not the only culprit among emerging and developing countries in allowing food going waste in a milieu of growing hunger. The FAO says 42% of fruit and vegetables and up to 20% of the grain produced in the Asia-Pacific region will never reach the consumer. India, however, starkly stands out because of sheer volume of its production of grain and horticulture and level of poverty. Favourable weather has raised India’s horticulture production to 280.70mt in 2013/14 from the previous season’s 268.84mt. From a report by the country’s leading chamber of commerce Assocham, it will be deduced that rising production will call for celebration only when the country is equipped with sufficient on-farm processing facilities, cold storage capacity and a refrigerated transportation network. Thiagarajan says, India’s requirement of cold storage space to keep fruit and vegetables fresh round the year and cosmetically appealing is conservatively estimated at over 60mt, while the available capacity of 30mt is unevenly distributed among 30 states and seven union territories. Production of most fruit and vegetables is seasonal but the demand remains more or less even round the year. This combines with the fact that horticulture products degenerate quickly unless “these are scientifically harvested and kept refrigerated till their arrival at the table are problems crying for solution,” says Thiagarajan. Reacting to various estimates of spoilage of horticulture products in India — like 40% by the FAO and 30% by government officials — he says what is “missing is any authentic estimation of loss. Whether it is here or in any other major horticulture producing country, it will be advisable to get comprehensive surveys of wastages done with assessors going to grassroots where different crops are grown and then cover the entire supply chain up to the table.” Building an extensive network of cold chain and refrigerated transportation is an expensive proposition in which the initiative is to be taken principally by governments. It also falls on them to create the right condition for the private sector, including supermarkets to participate in cold chain network building. Indian political parties cutting across their ideological disposition are not, however, showing enthusiasm in allowing foreign direct investment by supermarket chains like Walmart and Tesco. What is not to be wished away is that such chains are not only supposed to offer better prices to growers of fruit and vegetables but also make these available to final consumers at lower rates. It is common knowledge here that the food marketing system is so tilted in favour of aggregators and traders that prices of fruit and vegetables at the first point of sale as a proportion of final retail rates are in the range of 25% and 40%. Unfortunately, New Delhi so far has not found a way to reform the food trade system in a way that will benefit growers and final consumers at the same time. Hopefully, global supermarket groups will be able to clear Indian misgivings about their functioning, like no lobbying for getting policies tinkered in their favour. Going forward, they will have to appear convincing that their operation, involving creation of cold chain capacity will bring better rewards to farmers as it will make food prices attractive for consumes. At the same time,Thiagarajan believes that groups of progressive Indian farmers should be encouraged to form co-operatives, thereby creating conditions for them to pool resources to participate in the national campaign to build cold chain. As through co-operatives, they will elevate themselves to marketers, they stand to secure better prices for their produce from the trade and supermarkets. Indian farm sector contributing over 14% to gross domestic product is on the cusp of change.